From the Las Vegas stage to the New Hampshire Motor Speedway frontstretch, Recycled Percussion will perform the pre-race concert before the Overton’s 301 Monster Energy NASCAR Cup Series race on July 16. Led by Granite State native Justin Spencer, speedway officials announced on Tuesday that Recycled Percussion will play a 45-minute free concert for the fans starting at 11:45 a.m.
A mix of rock and an interactive experience for fans, Recycled Percussion’s four-man group uses power tools, buckets and anything they can use their drumsticks on to produce a wild blend of music and comedy. 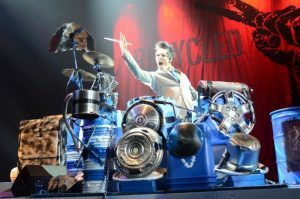 Since Spencer formed Recycled Percussion in 1995, the band has been on a tear, performing their junk rock style on television shows like “America’s Got Talent”, “Carson Daly”, “The Today Show”, “China’s Got Talent” and the Latin Grammy Awards. After being featured on the cover of USA Today in 1999 and being voted National Act of the Year a record-breaking six times, the band gained world-wide recognition, eventually sealing a deal to headline in Las Vegas, where they remain as one of the most popular shows on the Strip in Planet Hollywood’s Saxe Theater. Recycled Percussion consists of Spencer, Ryan Vezina (body percussion specialist), Matt Bowman (guitar player) and Todd Griffin (DJ) – all of whom attended Goffstown High School together. The group uses objects like trash cans, buckets, ladders, power tools, and other materials to create a unique rock experience. For more details on how you can get stagefront access to Recycled Percussion or for ticket information on all events at New Hampshire Motor Speedway, including the July Overton’s 301 and September ISM Connect 300 Monster Energy NASCAR Sprint Cup Series weekends, please stop by Fan Relations, visit the speedway website at www.nhms.com, or call (603) 783-4931.